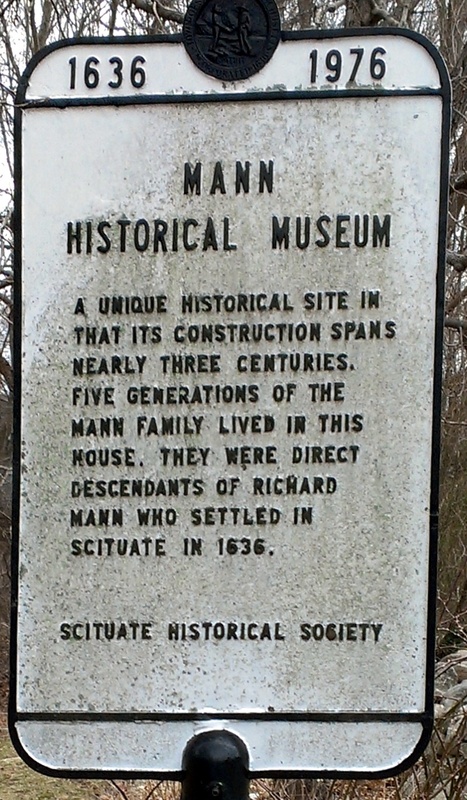 Three generations of the Mann family lived at the Mann Farmhouse at the corner of Stockbridge Road and Greenfield Lane, direct descendants of early settler Richard Mann who lived on North Scituate’s Mann Hill overlooking Mushquashcut Pond where he met his death in 1655/6. John Mann or possibly his father Capt. Thomas Mann built this typical full Cape. The ell was added and served as a summer kitchen, storage area and workshop. Percy Mann, grandson of John Mann and a seventh generation descendant of Richard Mann, lived in this house until 1968. He died at the age of 93. The artifacts of the Mann family on display in the Mann Farmhouse date from the seventeenth century to the present time. They were given to the Town of Scituate under the custody and administration of the Scituate Historical Society by two Mann family heirs. The artifacts include primitive Pilgrim furniture, carpenter and shoe making tools, military items, china, children's toys, early farming equipment and many valuable documents and books. The collection reflects the varied trades at which the Mann's worked: farming, maritime trade, soldiery in every American war, religion, education, sail making, and more. Several other points of historical interest rest on the grounds of the Mann House property. After Percy Mann had a run-in with the town’s officials in the 1920s, he decided that rather than pay vehicle registration fees, driver’s license fees, and car insurance, he would just drive his automobile into the back yard, park it and never drive it again. Over the course of time a tree grew up through the middle of the car, which remains where Percy left it almost a century ago. At the eastern end of the land is the final resting spot of Zebby, Percy’s beloved horse. A replica barn, built by local students in the 1970s, contains a fantastic collection of ancient farm tools. On the grounds of the Mann House, the Scituate Garden Club’s magnificent Wildflower Garden delights all in season. In 1980 the garden club carved out of the overgrown wilderness the beginning of what would someday be a nationally recognized design. Over the years, garden club members have maintained and developed the garden to its present impressive size, showcasing mostly wild and predominantly native plants. The Scituate Garden Club has been awarded two national awards and several state and district garden club awards. In June of 1986 the Garden was presented to the town as part of Scituate's 350th birthday celebration.